It’s time for my Conservation Big Year to begin! My goal this year will not be focused on out-of-range rarities that are common somewhere, but on species of conservation concern as defined by the American Bird Conservancy, with a few additional species that seem to me to be declining seriously. So my “target list” includes about 177 species. Some are found only up in the Arctic, which I just can’t afford to travel to this year, so I don’t expect to see anywhere near all of them. I’ll be looking at every bird I can find as I search for those target species, and by year’s end, I hope to have seen at least 500 species and to have taken at least marginal photos of most of them. I’d set my goal at 600 if I had more money and time and no family. Pursuing so many birds will involve a lot of travel, which not only will keep me away from home more than I really like and use more money than I really have—it will also exact a high cost in terms of using natural resources. I’ll be doing my best to minimize my use of energy and water in other ways this year, and whenever possible I’ll try to carpool to birding destinations. I’ll keep track of every mile I travel for birding by every means of transportation. At year’s end I’ll try to donate at least a penny per mile to the American BirdConservancy. In January, I’ll mostly be focused at home in Minnesota and in Florida, where I’m headed for the Space Coast Birding and Nature Festival. 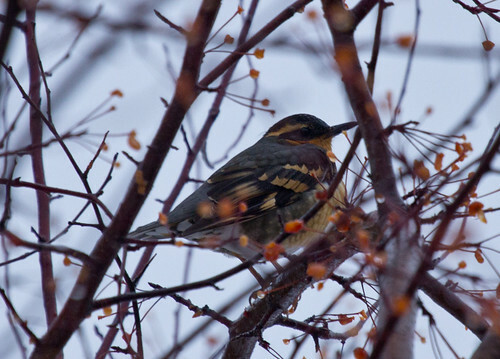 I’m hoping the Varied Thrush found during the Duluth Christmas Bird Count will stick around long enough for me to see it on New Year’s Day. Varied Thrushes are vagrants to the Midwest and East, but they’re of conservation concern in the Pacific rainforest, where they’re declining. Two gulls that have been appearing regularly in the Duluth-Superior harbor, Thayer’s and Iceland, are also ranked of conservation concern. 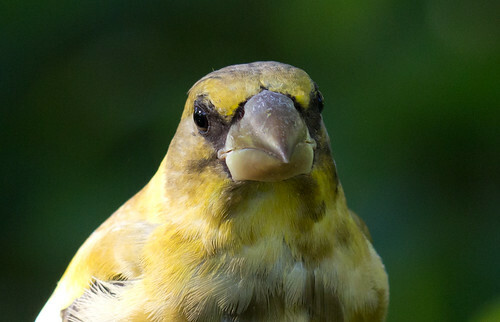 And one of my favorite birds of all, the Evening Grosbeak, is dangerously declining. 2012 was the fourth year in a row that not one appeared on Duluth’s Christmas Bird Count, but fortunately a handful have been regularly appearing in the Sax-Zim Bog. At mid-month, I’ll be driving to Florida, where it’s theoretically possible that I could see over 25 species of concern. Many of them are uncommon, but I expect to see at least a dozen, and, being an optimist, I have hopes of even more. So I’m setting my January goal at a total of 150 species, including at least 15 that are of Conservation Concern. I’ll be keeping a detailed field notebook and entering all my sightings for the year into eBird, too. That’s going to involve a level of self-discipline I haven’t mustered up in years. January: Minnesota, northern Wisconsin, Florida, mostly around the middle, from Sarasota to Merritt Island and the Viera Wetlands, and one pelagic trip with the Space Coast Birding and Nature Festival. 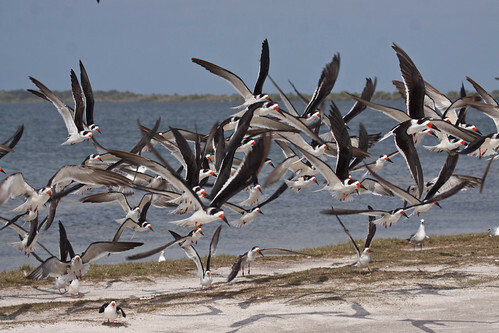 April: 13–21st to Colorado with Kim Eckert’s Minnesota Birding Weeks. 27th I’ll be speaking in Kansas near Cheyenne Bottoms. May: First week I MIGHT be speaking in Oklahoma. That would be SO exciting! Then I’m off to Delaware for at least a week (I’ll have one speaking opportunity), and then moving up the coast to Machias Seal Island, and then across northern Michigan for Kirtland’s Warblers and back home. The Wisconsin Society for Ornithology is having their annual meeting in Ashland, and I get to speak there, and then I’ll be teaching my usual Elderhostel (oops—“Road Scholar”) birding class with Troy Walters at Trees for Tomorrow in Eagle River, WI. June: Up in the air. Suggestions? Any chance it’s not too late for Colima Warbler? Southeastern Arizona and/or Grand Canyon? July: Up in the air. Suggestions? (Minocqua, Wisconsin, on the 27th and 28th. August–December: Up in the air. I’d like to go on at least one and maybe two Shearwater pelagic trips. Which would be best? And I’d like to get somewhere to see Yellow-billed Magpie and other California specialties. This entry was posted in Uncategorized on December 31, 2012 by Laura Erickson.